Koh Samui belongs to the tropical climatic zone. Thanks to its location in the nook of the gulf of Thailand, however, it is well protected from the serious influences of monsoons, typhoons and tsunamis. The weather in Samui can differ considerably from that in other parts of the country like Phuket or Pattaya. You should consider this fact when planning your vacation in Thailand. The average yearly temperature on the island varies from 23 to 33 degrees. The climate is even better on the northern and western coasts, which usually experience a pleasant sea breeze. The combination of heat and humidity will turn any Samui holiday into an agreeable health-improving experience. Though you can hardly notice the difference in weather while spending time on this island of eternal summer, it is common to divide the year into three seasons: dry, hot and monsoon/rainy. December – February. During this period, it rains very infrequently. Sometimes, there is a cool breeze and a slight wind; the perfect weather for windsurfing. There is also a lot of sun at this time, making this a wonderful alternative to the chilly European or American winters. March – August. During this time, there is almost no rain on the island, especially in March. The weather is often sunny and hot. This is a wonderful time to visit Samui if you are not afraid of the daytime temperatures of 28 to 35 degrees. The high air temperature is almost undetectable at the beach though, thanks to the cool, fresh sea breeze. Nevertheless, we still recommend avoiding the sun during the hottest hours of the day. Instead, you can spend this time inside one of our air-conditioned Koh Samui rental villas, a massage salon, an indoor pool or while enjoying any other type of entertainment out of the harsh sun. 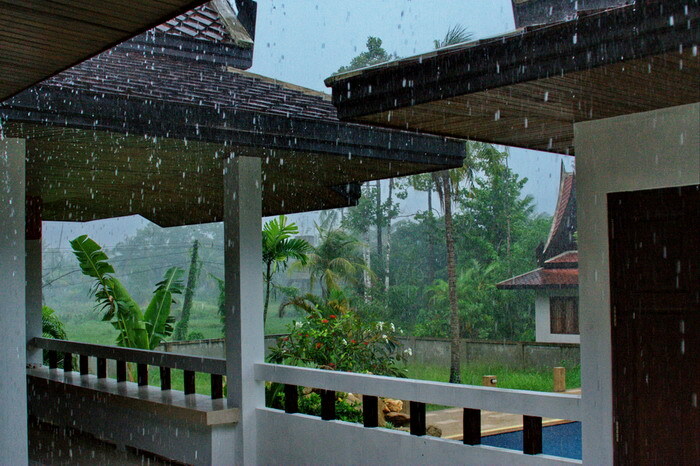 In March, 2011 – the month that is generally considered the driest in the year – there was a heavy cyclone that brought much rain to Southern Thailand and Koh Samui. This caused flooding on some parts of the island. Though the three-day downpour brought some hardships to tourists and inhabitants of the island, fortunately, it did not cause any serious damage or suffering. Nobody starved or had to sit on their roofs waiting for the rescue helicopters. The news on TV and in the press was still exaggerated though, as often happens with news from Thailand. In summer, the weather on Samui is very pleasant especially in July and August. Evening or night rains bring freshness to the air, and partly cloudy skies make staying outdoors much more comfortable even during the hottest time of the day. September – November. It is still hot during the rainy season in Thailand, but there are fewer sunny days in comparison with the other times of year. On some days during this season, you can also be caught in a real tropical downpour. Do not be afraid though, as pelting rains usually fall for a short period of time. Besides, they are very important for refilling freshwater supplies on the island. According to many tourists, even the Samui’s rainy weather in November is much more pleasant than the dank weather found in Europe or Northern America at the same time. Keep in mind that this division of the calendar year into seasons is rather approximate. At any time of year, there can still be unexpected surprises when it comes to the weather, although these are hardly probable.